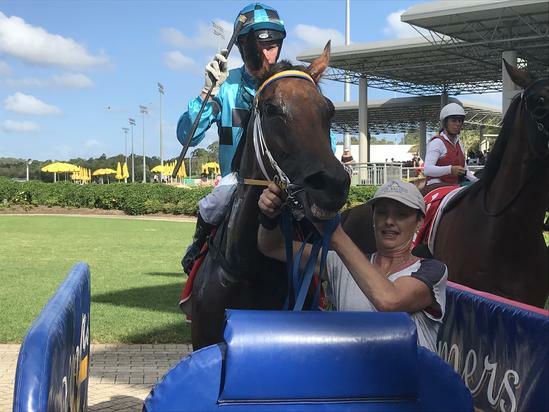 The recent good run for the Aquis Farm/Team Guy combination continued today at the Sunshine Coast with promising staying commodity Protest taking out the Apex Building Products Maiden Handicap. The daughter of Smart Missile broke her maiden at only her third start and her first run over the 1800 metres after putting the writing on the wall at her previous two starts. Settling just off the speed Protest looked to be struggling at the 600 metre point but after strong riding the filly responded with a solid turn of foot to chime in at the 300 metre mark and race away from her rivals and in doing so reeled off a very impressive last 600 metres of 34.86. Protest was ridden by Ron Stewart who was taken aback by the filly’s strong finishing burst after looking like she was struggling “What I really liked about this filly is the way she found gears when I asked her for an effort. I actually thought approaching the corner we were in trouble but she let down and before I knew it we had hit the front and in the end in was a soft win and I doubt it will be her last”. Winning Co Trainer Bryan Guy was also impressed with the improving fillies strong finish and explained that she is a work in progress “She has always had an attitude and she likes things done her way but we don’t mind that as she looks to have a future as a stayer. From day one she showed this staying potential and it’s great to train for Aquis Farm because they have shown patience with her and hopefully now she will go on to repay us all”. Protest was purchased out of the 2016 Magic Millions winter sale and ironically was the second three year filly this week to win for the Aquis Farm / Team Guy combination that was brought from the sale with Co Trainer Daniel Guy commenting after the race “She was the least expensive out of the three fillies costing only $20 000 but they don’t know what they cost and given she looks to have staying ability the winter carnival may be a prosperous time for her. I would also like to pass on a big thanks to the staff back at the stable and her regular track work rider Kris because she does have a tendency to keep all of us on our toes but we won’t mind it if she keeps winning”. All going well Protest will now be aimed at a three-year-old open over today’s winning distance of 1800m at the Aquis Farm Race Day on the 6th of January at Aquis Park at the Gold Coast Turf Club.